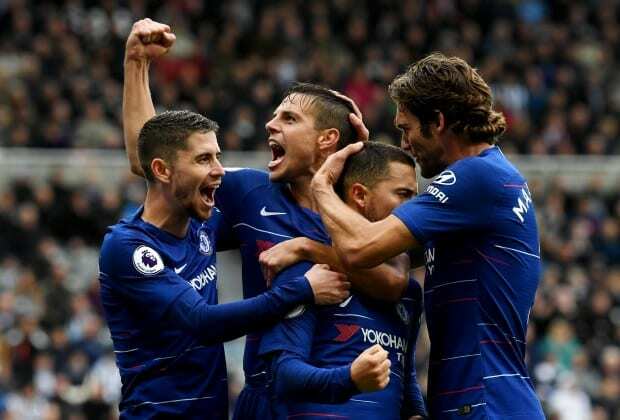 Palmerbet Sports Team’s Premier League Preview has EPL Tips for every match of Week 16, headlined by a massive clash between big guns Chelsea and Manchester City. Final Thoughts: AFC Bournemouth arrested a four-game losing streak with their 2-1 home win over Huddersfield midweek. They scored twice in the opening 22 minutes to set up the win and jump to seventh. But the Cherries face a tall order to go back-to-back. Second-placed Liverpool are still unbeaten with 12 wins and three draws. They took a while to get going at Turf Moor midweek, but scored three time in the last half-hour to down Burnley 3-1. Burnley’s opener was just the sixth goal the Reds have conceded all season – the best record in the EPL. After Bournemouth chalked up a home win and an away draw against Liverpool in the 2016-17 campaign, Liverpool won both clashes last season by a combined 7-0. Mo Salah and Roberto Firmino both scored in both games. It’s tough to find any other angle except a convincing Liverpool win in this one. Final Thoughts: Arsenal maintained their 13-game unbeaten streak with a 2-2 draw against United at Old Trafford midweek. But they will be a touch disappointed with that result after twice taking the lead, only to allow Man U to equalise minutes later. They have conceded nine goals in the past five games, but their sizzling attack is keeping them in touch with the front-runners. Huddersfield are hovering a point above the relegation zone after losing consecutive games to Brighton and Bournemouth by 2-1 scorelines. Scoring goals is Town’s foremost issue – they have found the back of the net a league-low 10 times. Huddersfield’s last win over Arsenal was in 1971. Last season the Gunners defeated promoted Town 5-0 at home and 1-0 on the road. Eight of Arsenal’s last 14 games have produced four goals or more – and with the attacking mood Unai Emery’s side are in, expect another high-scorer. Final Thoughts: Burnley looked a chance of a badly-needed result against Liverpool midweek when Jack Cork’s 54th-minute goal put them 1-0 up. But they leaked three goals thereafter to sink to their sixth loss in seven games and remain in 19th. The Clarets are conceding more than two goals a game on average. Brighton, meanwhile, have stormed into the top half with five wins in their last eight games – including back-to-back victories over Huddersfield (2-1) and Palace (3-1) in the past week. Romanian striker Florin Andone scored in both. Burnley and Brighton have produced a remarkable streak of five straight draws. Both of last season’s stalemates were scoreless. But on current form, leaning towards slight favourites Brighton shapes as the obvious way to go. Final Thoughts: Two of the Premier League’s bottom feeders square off in search of three valuable points to spark floundering campaigns. Cardiff have inched to 16th after winning three of their last seven, but they were swamped 3-1 at West Ham midweek. Southampton, winless in their last 11 games, lost by the same scoreline to Tottenham at Wembley just days after an encouraging 2-2 draw against Man United. Both sides only got on the scoreboard in stoppage time in their respective Week 15 assignments. Southampton have scored a league-low eight goals, while Cardiff aren’t much better with 10. Cardiff have won five of their last six against Southampton at home. They have also been far more formidable at Cardiff City Stadium this season, grabbing three wins and a draw with a comparatively acceptable -4 goal differential. The Welsh side look handy value as slight underdogs. Final Thoughts: Manchester United twice came from a goal down to salvage a 2-2 home result against in-form Arsenal midweek. But it was their third straight stalemate – following ordinary performances against Palace and Southampton – and they are eight points off the top-four pace. Fulham are in last spot but have shown some promise lately, beating Southampton and drawing with Leicester either side of a 2-0 loss at Chelsea in their last three. Less encouragingly, they have just one draw and a -15 for-and-against from eight away games this season. Fulham are winless in their last 10 games against Man United. They have won just once at Old Trafford since 1963. Surely, mercifully, this is the game embattled United get back in the winner’s circle. Final Thoughts: Last for the opening month of the season, West Ham continue to creep up the EPL ladder. They are now 12th after losing just one (to Man City) of their last six and have racking up back wins at Newcastle (3-0) and at home to Cardiff (3-1) in the past week. Crystal Palace continue to hover near the danger zone after picking up just five points from their past nine games. Their drought-breaking 2-0 win over Burnley in Week 14 was negated by a 3-1 loss at Brighton midweek. West Ham are unbeaten in their last five games against Palace, though both encounters finished in a draw last season. Hammers have won three and drawn one of their last six at home; the losses were to Spurs and Man City. The hosts are strong value for the win against a Palace side that has just a draw to show for their last five games on the road. Final Thoughts: The biggest clash of Week 16 sees fourth-placed Chelsea host unbeaten league leaders Man City. But Chelsea’s recent stumbles have taken the sting out of this blockbuster somewhat. After going undefeated for the opening 12 rounds, Chelsea have lost to Tottenham (3-1) and Wolves (2-1) on the road in the past three games. They are yet to lose at Stamford Bridge, however, and downed PAOK (4-0, Europa League) and Fulham (2-0, EPL) at home last week. Man City have been held to just two draws and are on a seven-game winning streak. After disposing of Bournemouth 3-1 on the weekend, they eased past Watford 2-1 in their away Week 16 assignment. They have scored 18 goals in their last five league games with seven different goal-scorers. The Citizens are on a three-game winning streak against the Blues. They chalked up 1-0 wins at home and away last season, while a Sergio Aguero brace powered City to a 2-0 win over Chelsea in the FA Community Shield at Wembley in August. A few weeks ago we could have seen Chelsea nabbing a draw against City at home, but on the strength of the rivals’ recent form the Blues’ unbeaten run at home looks set to end. Final Thoughts: Though they have drawn with some low-level opposition, Leicester are currently on a six-game unbeaten run, including two wins. They have come from behind with late equalisers against West Ham, Brighton and midweek at Fulham. The ninth-placed Foxes’ attacking potency has been down a notch but they have conceded only 18 goals so far. Tottenham responded to their 4-2 loss at Arsenal in a derby classic with a solid 3-1 home win over battling Southampton midweek. Harry Kane got on the scoresheet for the fourth time in five games, with Spurs scoring 12 times in total. Leicester have managed two wins and three draws in their last eight clashes with Tottenham. Last season the Foxes scored a 2-1 upset at home, before being edged out 5-4 in an extraordinary Wembley encounter. Harry Kane, Erik Lamela and Jamie Vardy all scored doubles in the latter. Another boilover could be in the offing here with Leicester proving a hard nut to crack in the wake of their owner’s tragic death. Look to the value in the hosts with a head-start. Final Thoughts: Newcastle are a modest 14th, but after a seven-week stay in the bottom three things are looking up for the Magpies. They have manged three wins and two draws from their last six games, recovering from a 3-0 home loss to West Ham with a 1-1 draw at Everton midweek. Twelfth-placed Wolverhampton ended a horror run that saw them pick up a solitary point from six games – culminating in dismal losses to Huddersfield and Cardiff – by upsetting Chelsea 2-1 midweek. Wolves trailed at halftime but Jiminez and Jota scored in the space of four minutes to secure the club’s biggest scalp since winning promotion. Wolves have won just one of their last nine against Newcastle, though four of those clashes finished in a draw and they pulled off a 2-0 victory in their last visit to St James’ Park. Wanderers’ momentous result midweek makes the teams tough to split at Newcastle. We’re backing the draw. Final Thoughts: Five places – but only three points – separate Everton and Watford in an intriguing Week 16 closer. Sixth-placed Everton have been quiet achievers, with their only losses in the last nine rounds (in which they’ve notched five wins) being hard-fought away defeats to Man United and Liverpool. But they would have hoped for more than a 1-1 draw from their midweek clash with Newcastle. Watford are 11th but their star is fading fast after picking up just one point from their past five games. Following their 2-0 loss at Leicester on the weekend, they arguably overachieved in a 2-1 home loss to Man City. But the fact remains they only have two goals from their last five outings. Watford have chalked up two wins and two draws in their last six encounters with Everton. But the best the Hornets have managed in 13 visits to Goodison Park is one draw. Both sides have been involved in a string of low-scorers and a draw is a chance here, but lean towards Everton at home.